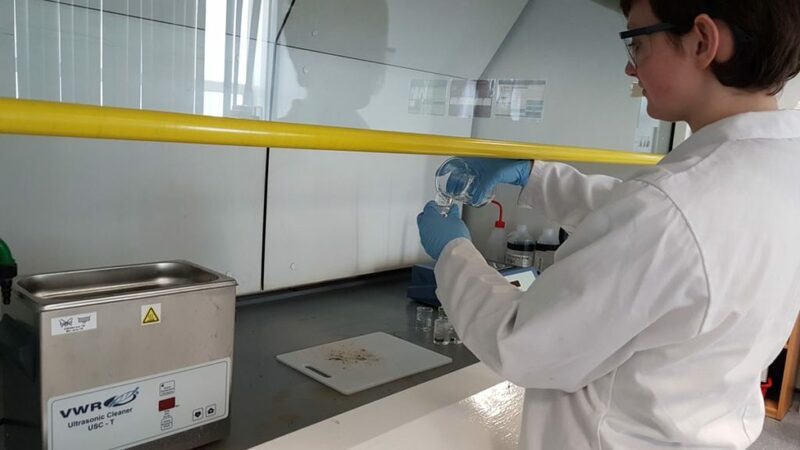 Our project students are getting started with their intensive semester of lab work, progressing toward their final piece of work. Ollie is using SEM to look at the condition of leather after being buried in the trial microcosms laid last year, and comparing it against various different animal leathers. Kirsty is using FTIR to look at changes in the wood samples after burial. Kirsty drilling the wood for powder. Strictly lab work here! 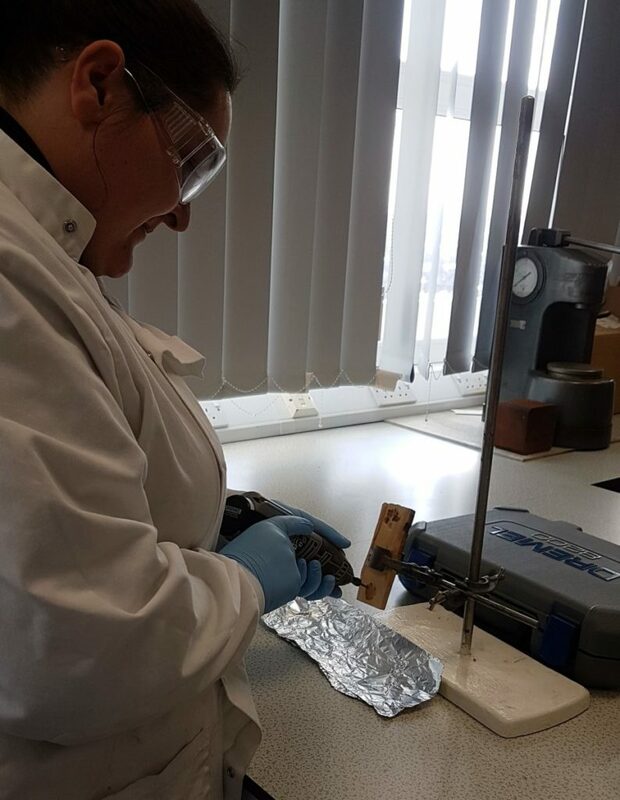 Talia and Kealey are looking at the differences between pre-sectioned and intact bone after being buried, with Talia using FTIR and Kealey using XRF. Talia expects to see a change in the crystallinity of bone (alterations in the structure of molecules). Kealey is looking into ion exchange, or rather, uptake and leaching between the bone and the soil. Kealey getting ready to clean the gack from her bone samples. Don’t put your hands in the sonicator or you might shatter your wrist! Helga is being a busy bee! 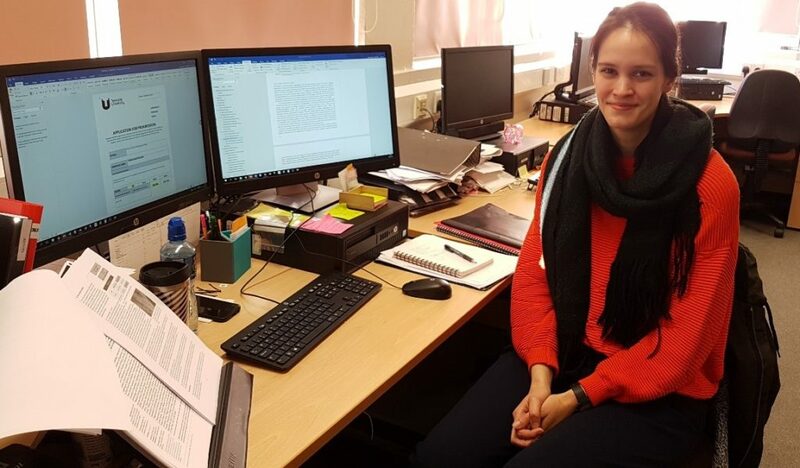 her project is taking a bit of a proteomics turn as she’s looking into the proteins and collagen degradation of archaeological leather. Whilst doing this, she’s also been writing up her progression report, ready to submit before shooting off to Amsterdam to see ol’ Kendrick Lamar! 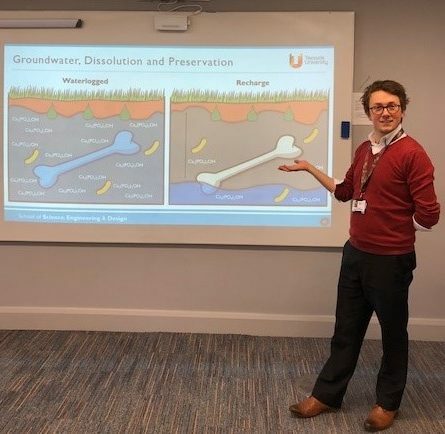 Finally, Rhys has passed his progression presentation, where he discussed his research into bone diagenesis and the dynamic, complex conditions at Vindolanda. He can now continue his exciting work with Vindolanda in the second year of his PhD- excellent news!